Train colliding with vehicles is an unfortunate occurence we come across from time to time. Mostly, it will be an accident caused due to the impatience of the vehicle driver. But in this case, it is impatience, wrong timing and absurdity. According to TOI, a commuter train in Florida collided with an SUV and the vehicle's driver has been injured. The video footage shows the driver entering the railroad crossing gaurdrails the last moment before it closed. 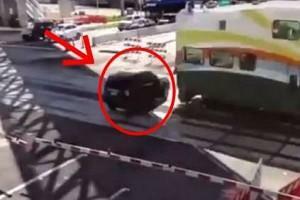 She waited for a while and a moment before the train crosses, she tried to cross the track but her car got hit by the train. A nurse on the train and others rushed to help the woman and she was taken to the hospital with serious injuries. Car traffic has been closed and trains were delayed for 90 minutes. The officials said the train had 82 passengers and 2 employees on it.